Stabilizing one of many tunnels on the high-speed rail line between Bologna and Florence, Italy. Microdrilling equipment is incredibly versatile—and can solve many underground construction challenges that traditional drilling equipment cannot. Today’s advanced microdrilling equipment offers contractors the ability to achieve higher production rates and greater drilling depths with sophisticated digital control. Yet with all the options available, selecting the right equipment for a job still requires specialized experience. The challenge in all foundation and underground drilling work is that the operator can’t see what’s going on beneath the surface. Microdrilling adds another layer of complexity to the process. The choice of equipment depends on a number of jobsite conditions and requirements that include confined spaces, complex soil conditions, and water management. In crowded urban environments, for instance, one consideration is selecting a rig that delivers the highest production speed while also fitting into confined spaces. That’s where a multipurpose drilling rig such as the Soilmec SM-5, with optimized articulation via a telescopic boom and sliding mast, might work well. The transport dimensions are only 5.25 feet (1.6 metres) wide, about 7.6 feet (2.3 metres) tall, and 15.4 feet (4.7 metres) long! The 72 kW installed power, wide selection of hydraulic rotary heads and torque values ranging between 5,088 foot-pounds (690 daNm) and 7,170 foot-pounds (972 daNm) allows for high performance in almost any civil engineering application. Microdrilling is also ideal for variable and/or difficult soil conditions, particularly in today’s high profile transportation projects. Toronto, for instance, is preparing to begin construction of its 20.5 mile (33 kilometre) Eglinton Crosstown light rail subway line. Tunneling will be required through highly variable soil deposits ranging from loose sands to dense sands and hard silty clays containing cobbles and boulders. Large boulders, especially those with a diameter larger than 1.64 feet (0.5 metres), can create problems during tunneling operations. Furthermore, the roundwater table is up to 65.6 feet (20 metres) above the proposed rail level. Water pressure at the face of the tunnels could be up to about 200kPa. The Soilmec SM-5 hydraulic microdrilling rig combines a compact design for easy transport and fast assembly that is ideal for tasks in confined spaces. Construction of the tunnel tubes for the underground rail will be carried out using tunnel boring machines (TBMs) with installation of precast segmental linings. Depending on the surrounding infrastructure, construction crews will likely rely on microdrilling techniques to reinforce surrounding deep foundations. The job could include jet grouting for ground improvement to soft soils below the rail embankments, large-diameter drilled shafts for bridge foundations, or grouting or micropiling to stabilize tunnel faces. Lessons learned during the construction of Italy’s Alta Velocità (AV) line from Turin to Salerno relied on many of these methods. The Bologna-to-Florence segment of the AV line is predominantly underground through the Apennine Mountains, and required a number of short tunnels to minimize visual impacts and to reduce noise and vibration. Near the Bologna AV Station, an in-service masonry railway bridge sat in the path of the AV tunnels, which ran parallel to and just below the bridge centre line. Contractors bored multiple arrays of grouting lines from several remote access locations to specific points along the tunnel routes to underpin the structure. As the tunnel boring machines passed, grouting kept the bridge settlement to less than four millimetres and final settlement was .2 inches to .3 inches (five to eight millimetres). Without this intervention, the structure had been predicted to settle between .8 inches (20 millimetres) and 2.0 inches (50 millimetres). In Toronto, the crews might select the new Soilmec SM-18 multipurpose high performance drilling rig. It combines power and performance in a modular machine that is ideal for micropiling, jet grouting, soil nails, underpinnings, and tie backs. Developed from the fusion of Trevi Group jobsite experience and Soilmec technological research and testing, the new SM-18 offers greater drilling depths due to higher crowd and extraction force (more than 11 tons) than comparable rigs on the market. The rig incorporates both a fixed and radio control remote control board so that the operator can choose the best working location. The third common challenge in microdrilling operation is water management. Micropiling, for instance, requires a significant amount of water and environmental regulations often require that the water is treated and recycled. Experienced microdrilling professionals can help contractors implement advanced water recirculation systems that recover virtually all water on a project, clean, and re-use it repeatedly until the project is complete. Other requirements that may be necessary to consider range from spoils treatment to the optimal selection of downhole tooling for a given geotechnical condition to electronic monitoring of construction processes. 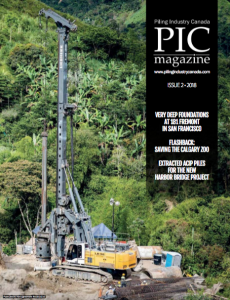 Today’s microdrilling machinery and techniques are exceptional and successful projects require careful consideration of all critical factors. As part of the Trevi Group, Soilmec understands these requirements for successful microdrilling and is committed to providing customers with the total solution. Soilmec has been developing microdrilling equipment and solutions for more than 30 years based on the input of the firm’s field experienced professionals. To make the most of a micropiling job, match the equipment choice with expert counsel. Dario Corso is the micropiling technical manager with Soilmec. Reach him at d.corso@soilmec.it. Mike Abruzzo is American Equipment’s North American representative for the U.S. east coast. Reach him at m.abruzzo@American-Equipment.com.